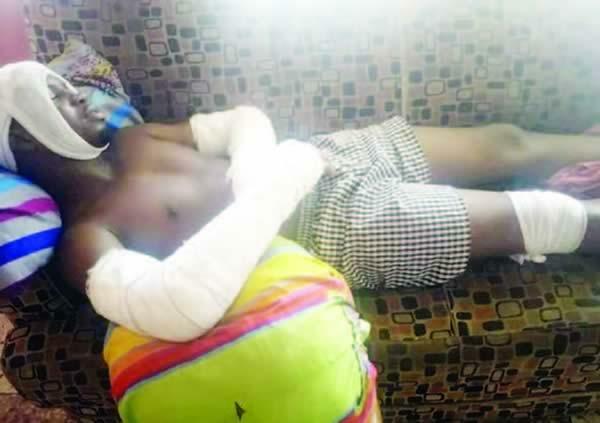 A 200-level Material Science Engineering student at the Kwara State University, Oluwadara Adedayo, is battling with injuries after he allegedly jumped off the Cele-Okota Bridge in Lagos State. Adedayo was allegedly chased to the bridge by some armed policemen attached to the Anti-Kidnapping Unit of the Lagos State Police Command. It was learnt that Adedayo, who was currently on Industrial Training in Lagos, was heading towards the Yaba area of the state last Monday when he was accosted by the operatives at Cele bus stop. The Punch gathered that the cops, after stopping the 24-year-old, decided to check a mobile phone and a modem found on him. Adedayo, who said nothing incriminating was found on him, explained that the policemen eventually bundled him into the bus. He said, “They ordered me to enter the bus they brought and I refused. I demanded to know what I did to warrant me entering their bus but they did not say anything, only for them to bundle me inside the bus. Adedayo stated that once he jumped down from the bus, he crossed to the other side of the road and ran to the Cele-Okota Bridge. The Kwara State indigene added that one of the cops chased him on a motorcycle. Adedayo, who noted that he became unconscious after landing, said the policeman and his colleagues immediately fled the scene. He said some Good Samaritans took him to a private hospital, where he was rejected. “I was then rushed to the General Hospital, Isolo, from where I was transferred to the National Orthopaedic Hospital, Igbobi. “I have not reported the incident in any police station because have just been discharged from the hospital,” He added. The phone number of the Lagos State Police Public Relations Officer, CSP Chike Oti, was switched off on Monday and a text message sent to the number had not been replied to as of the time of filing this report.